Tradies who have the need for their own portable lift will be impressed by the ‘Tradies Combo’ on offer from Genie. This popular combinat ion comprises a Genie® GS™-1932 scissor lift supplied on a blue custom built tandem axle trailer. This is a complete self-contained package, ready to tow away and ready for work. The combo is ideal for painters, plumbers, electricians, anyone who has the need to work at elevated heights. 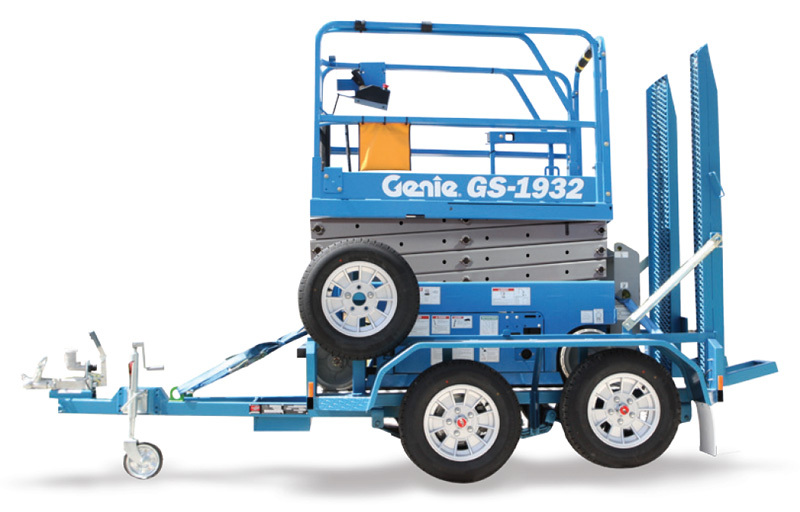 The Genie GS-1932 is a durable self-propelled electric scissor lift. The maximum platform height when fully extended is 5.79 m. This delivers a maximum working height of 7.79 m. When working indoors, the platform is rated to carry two people. All up weight of the Genie GS-1932 is 1,500 kgs, making it towable behind most trade or commercial vehicles. For full details of the Tradies Combo together with pricing, contact your Genie Regional Sales Manager.